Today you’re going to look at some tips for overcoming resistance and wrap up with my final thoughts on what it takes to make these kinds of lasting changes. Remember that tired old cliche that the path to wellness is a marathon not a sprint. Well, you have 3 chances (or more!) every single day to feed and nourish your cells with the best possible foods, but if you stumble it is not the end of the world, just part of your adventure! One major change that can help is to initially clean your pantry out of any junk food or triggering foods that cause you to throw your conviction out the window and chow down with wild abandon. Removing the temptation from your house makes it harder for you to scarf down an entire bar of chocolate because first you will have to go to the store, buy it, come home, and eat it. This gives you plenty of time to think about whether you actually want the treat or if you’re just sabotaging your efforts because you’re starting to see success and it terrifies you. Sometimes though, you just need a little treat and that’s ok too. Just pick the highest quality you can. So if you’re going to eat chocolate make it fair trade, organic, dark, & delicious. Don’t waste your indulgence on a gross Hershey bar when there are so many other better choices out there. When you switch to a diet based on whole foods and very little processed or packaged meals it can be overwhelming at first, especially if you’re not sure what to do. Now I don’t want anyone sacrificing quality time with family or friends or missing out on pursuing any of your other hobbies in the interest of slaving away in the kitchen for hours. Yes you will likely be spending some more time in the kitchen than you were before going whole foods-based, but using some of these tips and tricks will help limit your time in the kitchen while still ensuring that you’re eating the very best foods to nourish your body and soul. Check out Part 1 & Part 2! Dedicating an evening or an afternoon to preparing meals and snacks for the week is an amazing way to save you time in the kitchen so you can put more of your boundless energy towards the activities you love. Check out my tips here! The most important aspect of overcoming resistance to healthy eating is to believe on a cellular level that you are worth the effort and deserve to feel healthy, happy, and strong. If you are stuck with the limiting belief that you deserve to struggle, eat crap, feel terrible, or stay overweight any effort you make to change is doomed to failure. So you have to start by cultivating a loving relationship with your body exactly as she is in the present moment. If you can appreciate what she does for you already even if you’re eating a suboptimal diet you can start the process of self-love and nourishment. Eating well is the ultimate form of self-care. You’re telling yourself with every bite that you deserve to feel fabulous and look amazing. This mind shift is not always easy to make, but mindfulness is key in changing old patterns. Whenever you feel yourself reaching for the chips try to catch yourself and hear what your mind is telling you. Once you figure it out stop and just say “I love you,” even if you end up devouring the whole bag. Especially if you end up eating the whole bag. You won’t be perfect (and who the hell wants to be perfect anyway?! DULL!) overnight, but recognizing when you start getting into these negative thought patterns is the first step towards overcoming them. I’m a big fan of the-fake-it-til-you-make-it mindset. Even if you don’t necessarily feel totally in love with yourself at the exact moment, the more you say it, the more it will become your reality. Eventually it will become your default setting and things that seemed impossible before, such as resisting the bowl of mac and cheese, will just be second nature because you no longer want to make yourself feel like crap. And most importantly you will not longer believe that you deserve to feel like crap. Well friend, that rounds out my self-sabotage series. 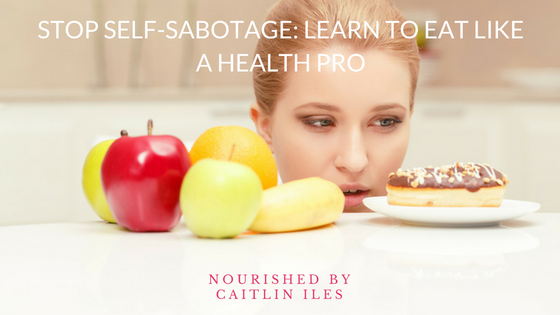 If you’d like to get my updated Stop Self-Sabotage Workbook you can download it free here! Thank you for your support!